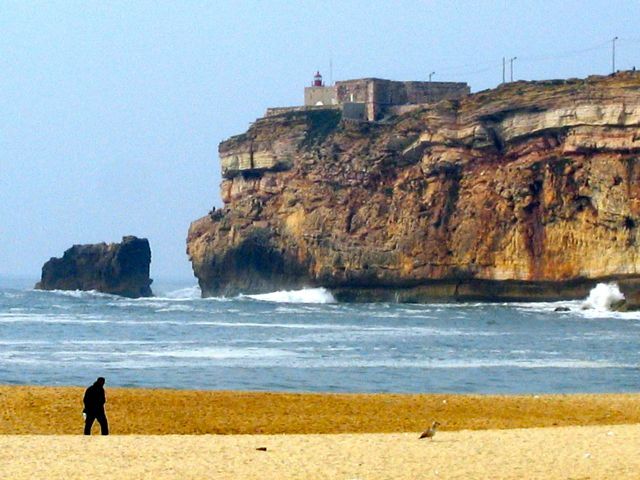 Nazaré has Portugal’s most beautiful beach, and here's why. 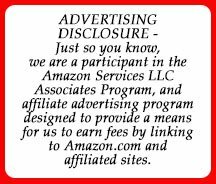 American extreme surfer Garrett McNamara slid down a record-breaking, 100-foot wall of water in 2011 to set the world record for the biggest wave ever surfed. That wave smashed the Atlantic beach at Nazaré Portugal, a historic fishing village and world destination seaside resort. In winter on this notorious stretch of ocean, big storms in the North Atlantic create massive swells towards the coast of Portugal. And this year McNamara had his record beaten by another extreme surfer, Andrew Cotton, who conquered an even bigger wave. The average visitor arriving in this sleepy fishing village wouldn’t think first about surfing. Narrow, cobbled streets and the seemingly quiet lives of the roughly 15,000 inhabitants made us want to immediately find a great restaurant with good sardines and wine for a leisurely afternoon lunch. 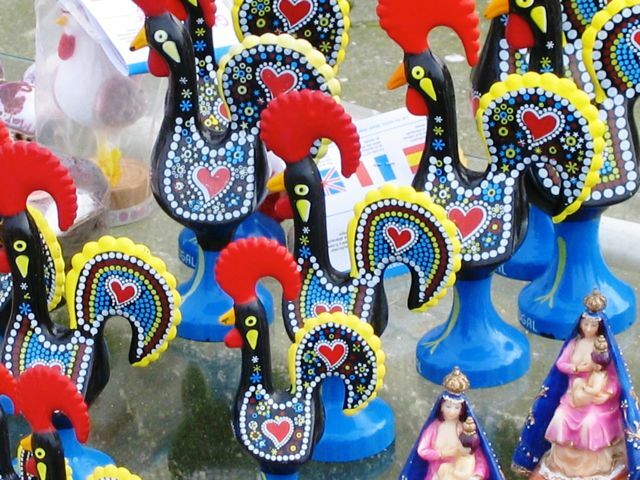 One of the most common symbols of Portugal is called the Rooster of Barcelos. The legend says that silver was stolen from a 17th-century landowner in the city of Barcelos. A man from the town of Galicia, passing on a pilgrimage through Barcelos, was arrested and, though he swore he was innocent, was condemned to be hanged. The judge decided not to eat the rooster, and as the traveler was being hanged, it’s said that the roasted rooster indeed stood up on the table and crowed as he’d predicted. The judge ran to the gallows and saved the pilgrim, who was still alive due to a faulty knot in the rope. 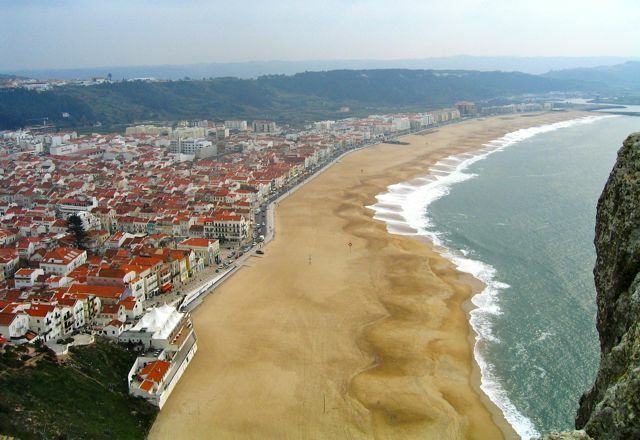 Named in the 4th century after the Biblical “Nazareth”, Nazaré has become Portugal’s most famous fishing village. When you see the beach, you begin to understand why. Until the 17th century the Atlantic sea covered most of the area we see today. The fishermen lived in the higher parts to remain safe from constant attacks by Dutch and Algerian pirates. Only in the early 19th century did the Portuguese inhabitants begin to live on the lower beach area, closer to the ocean. 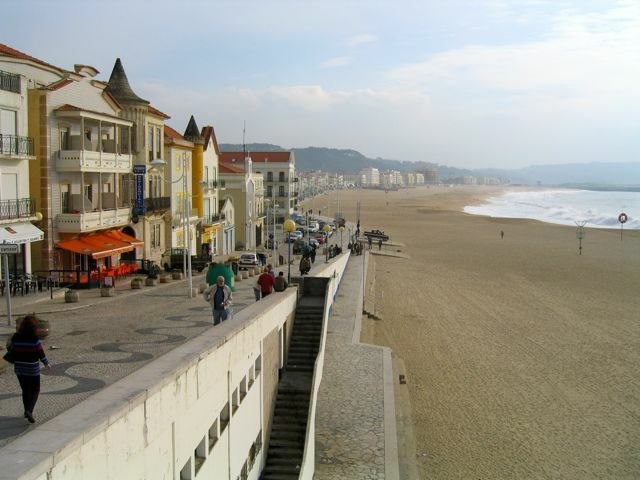 By the mid 19th century, Nazaré became recognized as a budding seaside resort. 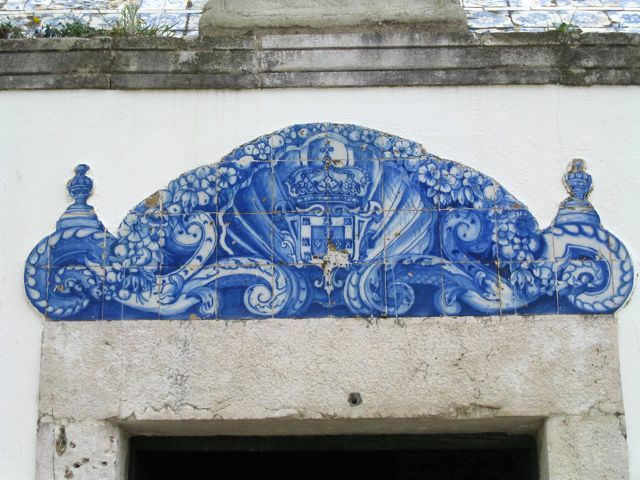 Everywhere in Portugal elaborate decorative tile work can be seen. This design of blue tiles decorates the top of an ancient doorway. 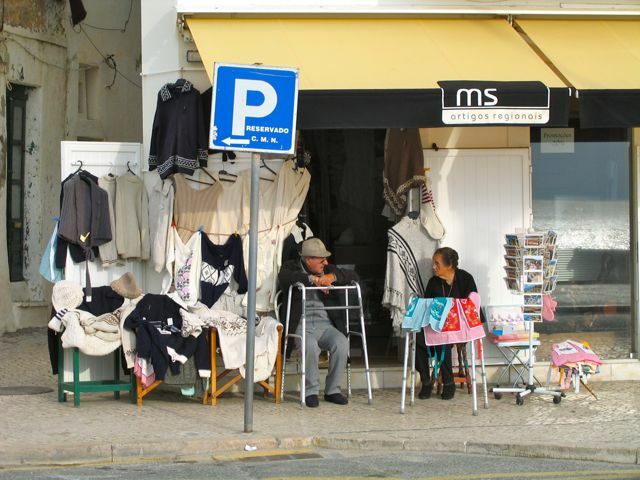 This Nazaré couple chats as they sit by their display of woolen sweaters, shawls and ponchos. Tourism really boomed in the 1960s, and now every year thousands of international tourists descend on this charming town with its fabulous stretch of seemingly endless beach. And in the winter international surfers now descend. 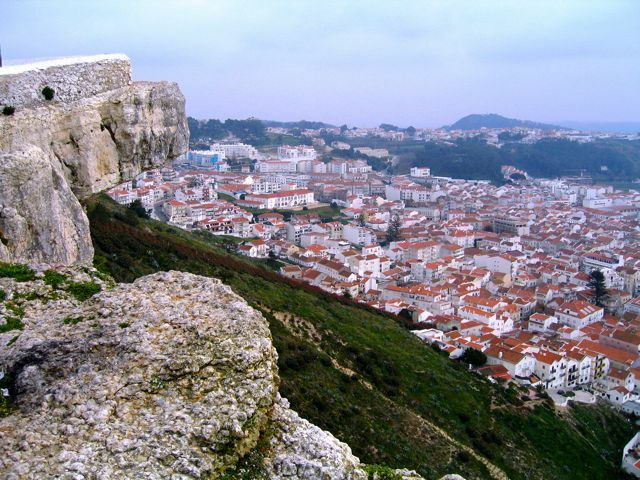 The top of the promontory is a neighborhood called Sítio. 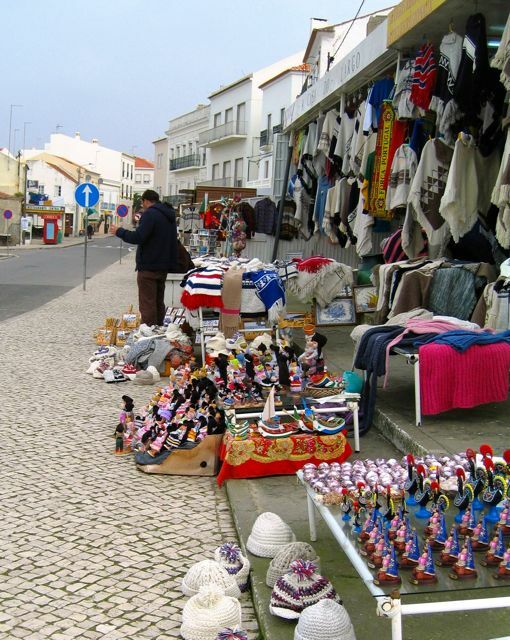 Since the 12th century it’s been a place noted for pilgrimage and religion because of an association to the legend of Our Lady of Nazaré and to the cult of Mary. 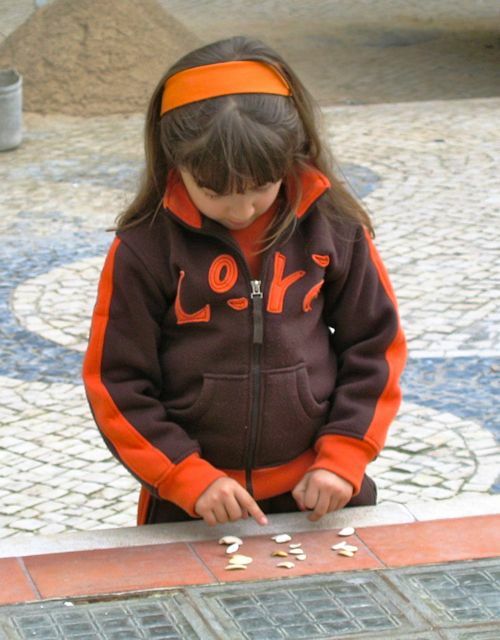 This little girl plays a traditional child's game with seeds. 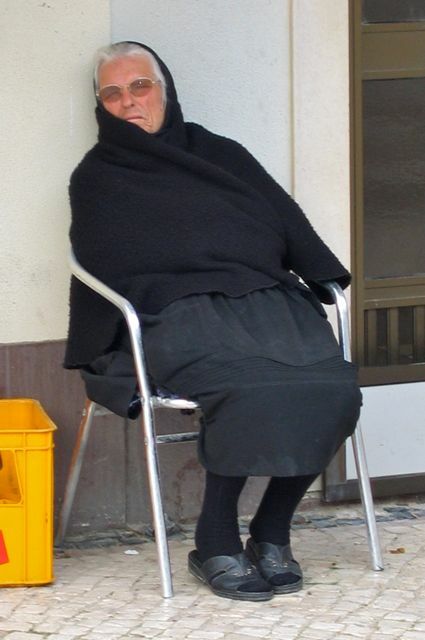 Portuguese widows traditionally dress in black. Its natural, rugged beauty and local fishing traditions make Nazaré the most unforgettable of Portuguese beaches. Though the ex is a California surfer dude from the 1950s, we didn’t go surfing. Tomorrow’s AtoZ Challenge: For the letter O, I’ll tell you about the Observatory at Griffith Park’s most interesting exhibit.